Envy TV operates in the streaming MLM niche. Instead of an actual corporate address, Envy TV provides a virtual office address in Nevada on its website. Cited as co-founders of Envy TV are Clay Sampson and Eddie Freeman. Beyond names however Envy TV fails to provide any information on either founder. My own research lead me to Clay Sampson’s LinkedIn profile. At first I wasn’t sure this was Envy TV’s Sampson, but I was able to later confirm it with an Envy TV launch prelaunch marketing video. Curiously, Envy TV is not listed on Sampson’s LinkedIn profile. partner(s) with industry-leading direct selling organizations to empower sales professionals with smart, automated technology marketing solutions that drive recruiting, product sales, and client engagement. Alexa traffic estimates for The Clay Code website suggest the business isn’t doing too well. 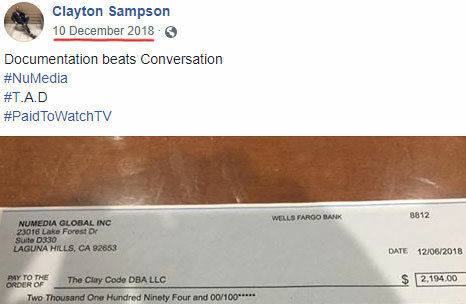 Between 2002 and 2007 Sampson was promoting World Leadership Group, a mortgage based MLM company. World Leadership Group went under in 2008. He appears to have bailed around the time Nui was sued by Texas for securities fraud in July. Up until mid 2018 Eddie Freeman (right) was promoting KZ1, a supplement based MLM company. Prior to October 2017 KZ1 was known as eXfuze. Freeman seems to have been with eXfuze for some time. 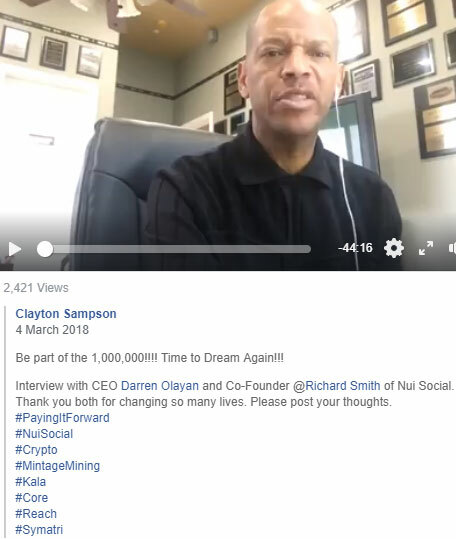 In the description of a 2012 eXfuze marketing video, Freeman claims to have already had 20 years experience in network marketing. Read on for a full review of the Envy TV MLM opportunity. Envy TV markets an IPTV service for $49.95 a month. Despite advertising the service providing access to “over 1000 channels!”, Envy TV fail to disclose who their service provider is. More importantly, Envy TV provides no broadcast agreements with any of the copyright owners of the content their IPTV service provides access to. sign up with an affiliate package. There is also a $997 Senior Affiliate Package, which affiliates can “upgrade” to if they have six recruited active affiliates under them. Note that an active affiliate is one who continues to pay $49.95 a month. Envy TV pays affiliates to recruit new affiliates. If any personally recruited affiliates upgrade to the Senior Affiliate tier, an additional $300 recruitment commission is paid out. Residual recruitment commissions are tracked via a unilevel compensation structure. purchase a Basic Startup or higher affiliate package. Once one of the above qualification criteria is met, a $2 residual commission is paid on every downline affiliate recruited into the unilevel team. Envy TV affiliate packages are bundled with recruitment certificates. When these certificates are activated by recruited affiliates, a 2% commission is paid out. Envy TV provides a volume bonus of up to 50% on monthly fees paid by downline affiliates. In order to qualify for the Affiliate Bonus Program, each Envy TV affiliate must personally recruit and maintain at least six active affiliates. Envy TV affiliate membership is either $49.95 a month. There is also a Senior Affiliate Package for $997 that can be upgraded to, if an existing affiliate has recruited at least six active affiliates. The first thing you need to look at with a streaming service MLM is whether the company has the rights to broadcast content. Envy TV are aware of this and address this as the first question in their FAQ. Currently under the US law it is not illegal to repackage or resell IPTV. The FCC has held that the IPTV resales do not violate any franchise or exclusivity agreements with cable providers under federal law. Also, if you are reselling broadcasts that are available online streaming on foreign servers as part of your IPTV packaging, courts have held this would not be a violation of the copyrights laws in the US. Note that despite claiming US courts are fine with copyright infringement, no examples are cited. For a real world example of what happens when an MLM company provides unauthorized access to copyrighted content, we need look no further than Dish Network LLC et al v. Tvizion, LLC et al. 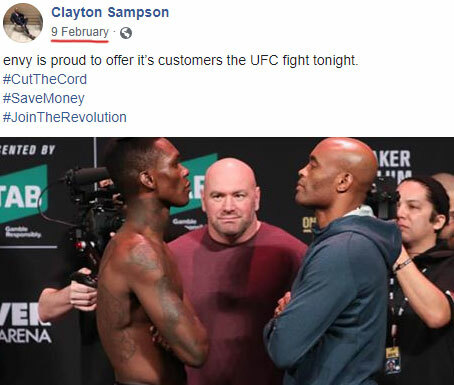 In mid 2018 Dish Network sued TVizion (as part of 247 SmartLife) for providing unauthorized access to a UFC fight. Dish Network didn’t care it was over IPTV, nor where the servers were located the provided the illegal stream. Envy TV would have you believe defending such a suit would be as easy as rocking up to court and citing purported examples of US courts signing off on copyright infringement. That of course didn’t happen. TVizion failed to defend the suit and Dish Network was eventually granted a $5.9 million judgment. Dish Network’s judgment was calculated based on an estimate of the number of $49.95 a month subscriptions TVizion had sold. $49.95 a month for access to pirated content. Sound familiar? It should because Clay Sampson was a TVizion affiliate (note Jim Pshehalouk rebooted it as NuMedia after Dish sued him). 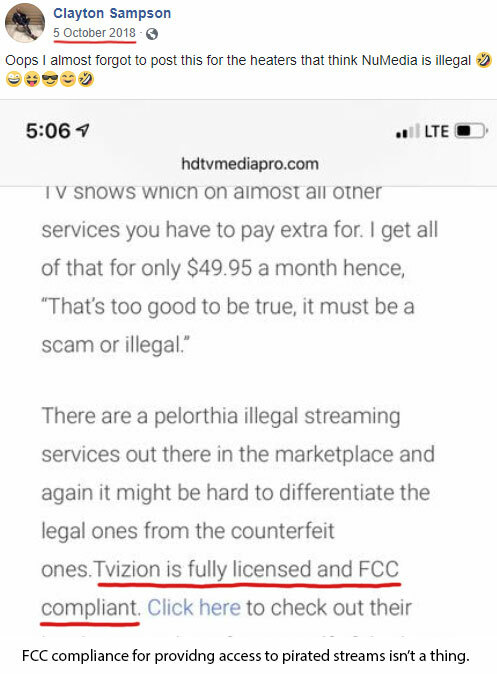 Rest assured if Envy TV was sued by a copyright holder they’d face a similar outcome to that of TVizion. That’s on a company level though. As an affiliate you’re probably not going to get sued, but you’re still running around selling access to pirated content. That’s a hit on your reputation and integrity as a marketer. And not something you’re going to get back should action be taken. Home-Based Business with Little Risk and Unlimited Potential for Wealth. The problem is everyone in Envy TV is an affiliate with access to commissions. MLM commissions are locked behind a six affiliate recruitment wall or purchase of an affiliate package. Regular affiliates however still earn $10 on each affiliate recruited. This alone is pyramid recruitment. I have a feeling Envy TV would argue affiliates who haven’t recruited and/or purchased an affiliate package aren’t affiliates. This argument was brought up by both Vemma and Herbalife in their respective FTC lawsuits. Both times it was shot down. The fact of the matter is a legitimate MLM company needs bona fide retail sales. Without which they’re operating as a pyramid scheme. One final point I want to touch on is Envy TV’s affiliate packages. The licenses bundled with these packages are essentially pre-paid affiliate memberships. These are not product purchases, because purchasing affiliate memberships as a product makes no sense. Envy TV’s affiliate packages themselves are thus nothing more than prepaid recruitment tools. Putting the copyright issue aside, one can’t even make the argument that affiliate packages contain something of consumer value. Between pyramid recruitment and providing access to pirated content, Envy TV’s MLM opportunity leaves much to be desired. Mortgage MLM? Lol. Borrow thousands of pounds against your house for the *sole* purpose of paying that borrowed money into an MLM pyramid as commission. Sounds totally suitable. There is of course nothing wrong with paying commission to the guy who advised you on your mortgage and bundling that into the loan. Paying commission from borrowed money to someone who had zilch to do with arranging the loan (other than recruiting your adviser) is another thing entirely. Shows how ludicrous the mortgage market was before the credit crunch that such a thing was viable for at least 6 years. And now one of its members is so desperate for an MLMable product he’s resorting to piracy. Go figure.